This is my first attempt at making Baklava. Let me tell you it was much easier than I thought it would be. Since I have ventured out and successfully made Spanakopita, I figured all I needed was patience and some phyllo dough. I have had a package of frozen phyllo dough in my freezer, that turned out to be non-wheat, and single sheet, which makes assembly so much easier than the double sheet that I used for Spanakopita. I used a jelly roll pan which fits the single sheet layer perfectly. The dough was a little dried out after unrolling, but it was still perfect after baking. I also used slivered almonds that I chopped up in the cuisinart. I would double the amount of almonds next time, or maybe add walnuts or pecans. My family and friends thought there was plenty of nuts, so this is just a personal taste. This tray of baklava disappeared very quickly when my son and his friends came home for the weekend, I actually had to hide a couple pieces for hubs, this is his very favorite dessert and he was thrilled that I had made it. I have also had a bottle of Rose Water that I really have been wanting to include in a recipe, this recipe called for Orange Flower Water and I substituted Rose Water for the Orange Water. The smell is wonderful. First, make the syrup by combining all of the ingredients in a heavy- based saucepan. Place over low heat until the sugar dissolves, it will look clear. Stir occasionally. Once the sugar dissolves, raise the heat and allow the syrup to boil until it is thick enough to coat the spoon. This should take about 2 minutes. Allow the syrup to cool and chill thoroughly. Brush a rectangular baking dish, about 12 x 18 inches, with some of the melted butter. Place about 8 sheets of phyllo dough in the dish, brushing the top of each sheet with some of the melted butter. Mix the nuts, sugar and cinnamon together and spread half of the mixture over the top of the phyllo. Place two more layers of buttered phyllo dough on top and then cover with the remaining nuts. Layer up the remaining phyllo, brushing each sheet with some of the butter. Remove the pastry from the oven and immediately pour over the syrup. Leave the pastry to cool and when thoroughly cold, cut into diamond shapes to serve. 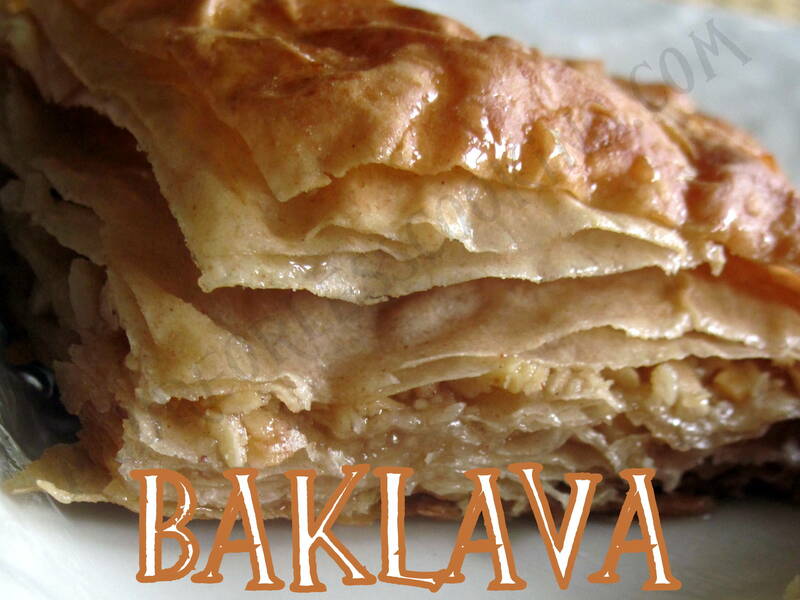 Baklava may be made several days in advance and kept in the refrigerator. Leave at room temperature for about 20 minutes before serving. Well now that looks amazing! How can I print this recipe without the comments? Copy and Paste to your favorite, such as word document.